Today, Bungie released another update for Destiny, a video game in which players travel through space imagining new content. The update comes with a few interesting tweaks—no more starting special ammo in 3v3!—but most importantly, it toggles a temporary new Valentine’s Day event called Crimson Days. Unlike previous events, this one doesn’t have much to offer PVE players other than a few new emotes. 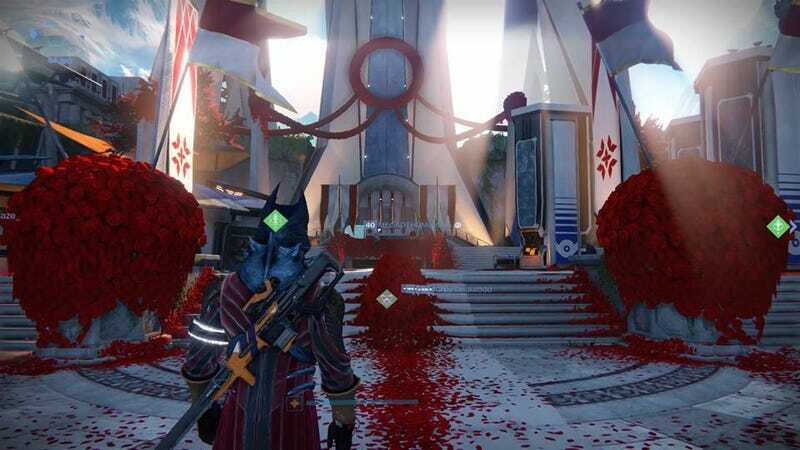 Crimson Days is all about PVP. From now until next Tuesday, February 16, there’s a new 2v2 playlist called “Crimson Doubles” that will let you and a friend team up against other fireteams of two. (There’s no matchmaking.) When your teammate dies in this mode, you’ll get a buff called Heartbroken that boosts your stats and makes you reload more quickly. Adorable, ain’t it? Do you feel it? Love is in the air. Also: murder. And malaise.